Dystonia musculorum (dt) is an autosomal recessive hereditary neuropathy with a characteristic uncoordinated movement and is caused by a defect in the bullous pemphigoid antigen 1 (BPAG1) gene. The neural isoform of BPAG1 is expressed in various neurons, including those in the central and peripheral nerve systems of mice. However, most previous studies on neuronal degeneration in BPAG1-deficient mice focused on peripheral sensory neurons and only limited investigation of the autonomic system has been conducted. In this study, patterns of nerve innervation in cutaneous and iridial tissues were examined using general neuronal marker protein gene product 9.5 via immunohistochemistry. To perform quantitative analysis of the autonomic neuronal number, neurons within the lumbar sympathetic and parasympathetic ciliary ganglia were calculated. In addition, autonomic neurons were cultured from embryonic dt/dt mutants to elucidate degenerative patterns in vitro. Distribution patterns of neuronal intermediate filaments in cultured autonomic neurons were thoroughly studied under immunocytochemistry and conventional electron microscopy. Our immunohistochemistry results indicate that peripheral sensory nerves and autonomic innervation of sweat glands and irises dominated degeneration in dt/dt mice. Quantitative results confirmed that the number of neurons was significantly decreased in the lumbar sympathetic ganglia as well as in the parasympathetic ciliary ganglia of dt/dt mice compared with those of wild-type mice. We also observed that the neuronal intermediate filaments were aggregated abnormally in cultured autonomic neurons from dt/dt embryos. These results suggest that a deficiency in the cytoskeletal linker BPAG1 is responsible for dominant sensory nerve degeneration and severe autonomic degeneration in dt/dt mice. Additionally, abnormally aggregated neuronal intermediate filaments may participate in neuronal death of cultured autonomic neurons from dt/dt mutants. Dystonia musculorum (dt) is an autosomal recessive hereditary neuropathy in mice caused by the ablative bullous pemphigoid antigen 1 (BPAG1) gene . The human homologue of the mouse sequence from the dt locus is on chromosome 6p12 . Heterozygous dt mice appear normal phenotypically, but homozygous dt mice develop dystonia. Young dt/dt mutants are typically smaller than their normal littermates, and at approximately two weeks after birth, they exhibit abnormal postures and progressive loss of movement coordination. Hyperflexion and pronation of foot paws are other symptoms [3, 4]. Previous studies have demonstrated substantial degenerative alterations involving the peripheral and central sensory pathways, and spinal motor neurons are slightly affected . This pathology appears primarily related to abnormal axonal accumulations of cytoskeleton in dt/dt mice [5–8]. The cytoskeletal interacting protein, BPAG1, appears in several isoforms in different tissues . The neural isoform of BPAG1 mRNA, BPAG1n, has been detected in a variety of neuronal systems during normal growth, such as in neurons within dorsal root ganglia, trigeminal ganglia, sympathetic ganglia, enteric nerve system, and spinal ventral horns . BPAG1n is generally expressed in neurons in numerous regions in wild-type mice, but not all neurons deficient in BPAG1 cause serious degeneration in dt/dt mice . Most previous studies on neuronal degeneration in dt/dt mice focused on the sensory nerve system [3, 5], whereas the autonomic nervous system was seldom addressed. In our previous study of spinal motor neurons in dt/dt mice, no significant neuronal loss was observed in the spinal motor neurons . However, the lifespan of these homozygous mutants is limited to three to four months. In human peripheral neuropathy, some evidences have indicated that sensory and autonomic neurons undergo degeneration together [10, 11]. Autonomic neuronal degeneration and sensory deficiency are assumed to play key roles in the early mortality of dt/dt mice. Investigations have revealed that the cytoskeletal interacting protein, BPAG1n, interacts with microtubules, microfilaments and neuronal intermediate filaments (IFs) and plays an important role in maintaining cytoarchitectural integrity [9, 12–14]. Pathological changes in dt/dt axonal degeneration have been found together with aggregation of IFs [5, 7]. Moreover, studies in transgenic mice and in transfected stable cell lines that overexpress neuronal IF have demonstrated abnormal IF accumulation in degenerating neurons [15, 16]. These results may also be significant to neuronal diseases, in which IF protein aggregation plays an important role in neuronal degeneration. Abnormal IF protein aggregations in the cytoplasm are critical because the hyperphosphorylation of cytoplasmic IFs may trigger the neuronal death [17–19]. In clinical neuropathy, neurodegenerative disorders are morphologically represented by progressive neuronal degeneration and associated typical cytoskeletal change [20, 21]. In addition, degenerative neurons with neuronal cytoplasmic inclusions have been observed in neuronal intermediate filament inclusions disease . Neuroscience researchers are deeply concerned with elucidating the neuronal degeneration and apoptosis associated with human neurological diseases. Accordingly, the neurological mutant dt/dt mouse can be adopted to examine the genetic and neurological basis of human diseases, such as peripheral nerve degeneration. The combination of impaired nociception and autonomic dysfunction, in which motor neurons were relatively or completely spared, is characteristic of autosomal recessive autonomic neuropathy . An investigation of changes in peripheral innervation and neuronal number within the autonomic ganglia of dt/dt may clarify the pathophysiology of mutation. 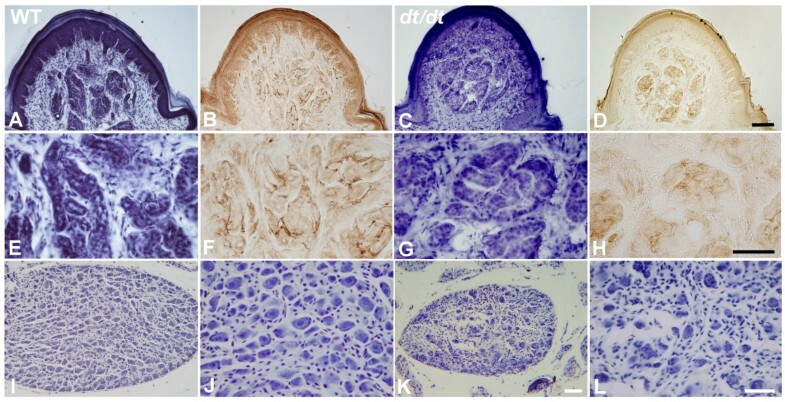 In this study, immunohistochemical analyses of cutaneous and iridial tissues, as well as autonomic neuronal counting within ganglia were performed on dt/dt mice in vivo. Furthermore, to study patterns of neuronal IFs in autonomic neurons of dt/dt, sympathetic neurons were collected and assayed in vitro. Distribution patterns of neuronal IFs in cultured sympathetic ganglia neurons were studied thoroughly using immunocytochemistry and conventional electron microscopy. B6C3Fe-ala-Dst dt-J mice, carrying a natural mutation in the BPAG1 gene, were utilized in this study. Experimental mice were collected from litters of heterozygous breeding pairs, provided by Jackson Laboratories (Bar Harbor, MA). Care and treatment of animals were in accordance with standard laboratory animal protocols approved by the Animal Care Committee (Chung Shan Medical University). A total of 26 adult mice (10 dt/dt and 16 wild-type) were selected by reverse transcriptase-polymerase chain reaction (RT-PCR) assays from litters of nine heterozygous breeding pairs for the following studies. Mice were sacrificed by cervical dislocation after anesthesia with choral hydrate (400 mg/kg of body weight, intraperitoneally). Total RNA from the tissue samples was prepared using TRIzol reagent and converted to cDNA using a reverse primer and reverse transcriptase (Invitrogen Corp., Carlsbad, CA). To amplify the cDNA, this study used Taq DNA polymerase and PCR, consisting of 40 cycles at 94°C for 30 sec, 65°C for 30 sec and, 72°C for 1 minute. Specific PCR primer sequences were prepared as follows: BPAG1n primers (5'-GAC GAG AAG TCG GTG ATA ACC TAT G-3' and 3'-CTG TTT GAG TAG GAC GGG CTT-5', producing a 511-bp fragment). The primers of β-actin applied as the positive control, were 5'-AAC CAT GAG GGA AAT CGY GCA C-3' and 3'-AGT CAA GGG AAT CGG CAG AAT G-5' (producing a 219 bp fragment). The eight-week-old mice were anesthetized and perfused with 4% paraformaldehyde. Tissue samples were collected and then cut on a freezing microtome. Floating sections were transferred into phosphate-buffered saline (PBS) solution, incubated in 3.5% hydrogen peroxide to eliminate endogenous peroxidase activity, and finally blocked using 5% normal goat serum and 0.5% Triton X-100 in PBS. Sections were incubated with the primary antibody against neuronal marker proteins such as gene product 9.5 (PGP 9.5, 1: 500, Chemicon, Temecula, CA) at 4°C for 16-24 hours. After rinsing in PBS, sections were incubated with biotinylated secondary antibody of the appropriate specie (Sigma-Aldrich, St. Louis, MO). The color reaction product was accomplished with a Vector ABC kit and with the 3, 3-diaminobenzadine (DAB) reaction (Vector Labs, Burlingame, CA). To prevent the DAB color reaction from being covered up by pigment granules in the iris, the fluorescence immunohistochemistry was applied. Iridial wholemounts were labeled with pan neuronal marker using fluorescence-labeled secondary antibody. Irises were incubated for 24 hours in the pan neuronal marker primary antibody (PGP 9.5, Chemicon) at 4°C. After washing, tissues were then reacted for 2 hours with FITC-conjugated goat anti-rabbit IgG (Sigma-Aldrich). Flat mounts were analyzed under a Zeiss Axiophot microscope (Carl Zeiss, Oberkochen, Germany). To perform quantitative analysis of the number of sympathetic neurons, lumbar ganglia were fully sectioned at a thickness of 8 μm. Every tenth section was subjected to examination to avoid double counting of cells, and a total of 15-20 sections were selected for each ganglion. Total number of neurons with both nucleus and nucleolus in the focal plane was counted. Statistical difference was determined by an analysis of Student's t-test. In ciliary ganglia, a different approach was adopted given its small size. Serial sections (8 μm) were stained with hematoxylin, and all neurons were counted throughout every section, covering the entire ciliary ganglia. Only cells with distinct nuclei were counted to avoid double counting of cells. For histograms of relative proportions of neuronal areas, the method was modified from the study of dorsal root ganglia . In sympathetic ganglia, the largest cross sections were chosen for cell counting to avoid double counting of cells. In ciliary ganglia, neurons were counted through sections (8 μm) of whole ganglia. The area of neuron with distinct nucleoli was determined. The area of each neuron was determined using the image analysis software (Image-Pro Plus v. 4.5, Media Cybernetics, Silver Spring, MD). For construction of histogram, total counting number of neurons analyzed in each mouse was taken as 100%. Neuronal size was sorted into groups at 50 μm2 intervals and the percentage of neurons falling into these size ranges was calculated. Pupillary responses were measured in unanesthetized age-matched eight-week-old wild-type and dt/dt mice. Each animal was allowed to adapt to darkness for at least 30 minutes. Subsequently, mice were placed on a custom-built stereotactic apparatus, by which animal movement was restricted by a 28 mm diameter polyethylene tube. A beam of light was directed to the eye for evaluation of the pupillary light reflex. The pupillary diameter was measured and used to calculate pupil area. To determine the effect of neuronal IF on developing sympathetic neurons, sympathetic ganglia were dissected and collected from mouse embryos at embryonic day 15.5. To determine the genotype each embryo from the heterozygous breeding, the spinal cord of each embryo was collected for RT-PCR analysis, as in our previous study . Sympathetic ganglia collected from each embryo were treated with 0.25% trypsin without EDTA for 20 minutes at 37°C. Cells from sympathetic ganglia were physically dissociated by pipetting, plated in culture dishes (Corning, New York, NY), and allowed to attach to coverslips plated with poly-D-lysine (Sigma-Aldrich). The culture medium was composed of Neurolbasal medium (Gibco, Grand Island, NY) supplemented with 20% fetal bovine serum, 2% glucose, 2.5 mM L-glutamine, 2% B-27, and 100 ng/mL nerve growth factor (R & D Systems, Minneapolis, MN). Cultured sympathetic ganglia cells were collected at 5 days in vitro (DIV) for further analysis. Cultured cells were fixed with a fixative containing 4% paraformaldehyde and 1% glutaraldehyde in 0.1 M cacodylate buffer (pH 7.4). Following post-fixation in 1% osmium tetroxide for 2 hours, tissues were dehydrated through a graded series of ethanol, and then embedded in Epon 812 resin. Ultrathin sections (70 nm-thick) were collected on copper grids, doubly stained with uranyl acetate and lead citrate, and observed under a Hitachi 7100 electron microscope (Hitachi, Tokyo, Japan). Embryonic neurons were cultured on poly-D-lysine coated glass coverslips in a cell culture dish. Cultured neurons were fixed in methanol for 30 minutes at 4°C and then permeabilized with 0.1% Triton X-100 in PBS for 5 minutes. After which, cells were incubated for 1 hour with primary antibodies against ubiquitin and medium-neurofilament (NF-M; Sigma-Aldrich), followed by washing three times in PBS. Samples were then incubated with secondary antibodies and Hoechst 33342 (Sigma-Aldrich) at 27°C for 1 hour. Hoechst 33342 was applied to stain nuclei. Subsequently, cultured neurons were mounted and examined under a Zeiss LSM 510 META confocal spectral microscope (Oberkochen, Germany). This study initially determined the expression patterns of BPAG1n mRNA from wild-type and dt/dt mice by RT-PCR. The BPAG1n mRNA could be detected in the dorsal root, sympathetic, and ciliary ganglia of wild-type mice, but not in that of dt/dt mice (Figure 1). RT-PCR analysis of BPAG1n and β-actin mRNAs from wild-type and dt/dt mice. BPAG1n mRNA could be detected in dorsal root ganglia, sympathetic ganglia, and ciliary ganglia of wild-type mice, but not in dt/dt mice. β-Actin primers were used as positive controls. To investigate sympathetic innervation, the skin of the footpad was immunoassayed using the antibody against PGP 9.5. In wild-type mice, various immunopositive nerves encircled the coiled tubules of sweat glands, forming an interlacing, dark, and continuous pattern (Figure 2A and 2B). In dt/dt mice, a few faintly stained immunopositive nerves were identified in the dermis of footpads (Figure 2C and 2D). In normal mice, numerous autonomic nerves encircled innervated sweat glands (Figure 2E and 2F). However, sweat glands were significantly denervated, with only weak and disorganized immunoreactivity around them (Figure 2G and 2H). This observation, it may be implied that autonomic nerves innervated sweat glands were poor in dt/dt. Histopathological analysis revealed that sweat glands in dt/dt mutants were not significantly changed. The morphology of sweat glands in dt/dt mutants does not differ in appearance compared with that in wild-type mice (Figure 2E and 2G). Localization of sympathetic nerves around sweat glands and neurons in sympathetic ganglion of wild-type and dt/dt mice. Serial sections of footpads were stained with hematoxylin or antibody against PGP 9.5 in wild-type (A, B, E and F) and dt/dt mice (C, D, G and H). In normal mice skin, numerous PGP 9.5-immunoreactive autonomic fibers were visible in dermis (A and B). Conversely, only some nerve fibers were identifiable in dt/dt mice (C and D). High-power photomicrographs revealed that autonomic nerves innervated sweat gland and displayed dense and strong PGP 9.5 immunoreactivity in normal skin (E and F), whereas only fragmented autonomic nerves could be observed in dt/dt mice (G and H). From the observation of lumbar sympathetic ganglia, many neurons could be recognizable in the section of ganglia of wild-type mice (I and J). However, only fewer neurons could be found in dt/dt mice compared with wild-type mice (K and L). Scale bars = 40 μm in A-H; 50 μm in I-L.
Additionally, the morphology of lumbar sympathetic ganglia was investigated. Typical sympathetic neurons with visible nucleoli were observed in wild-type mice (Figure Figures. 2I and 2J). The neuronal number was significantly reduced upon observation under quantitative analysis (Table 1 and Figure 2K), and more glial cells could be easily identified in the ganglia of dt/dt mice (Figure 2L). In irises, the wider diameter of pupil size was noticeable in dt/dt mice (Figure 3A and 3B). Dual autonomic innervation occurred in both sphincter and dilator muscles of the iris. In the wholemount iris of dt/dt mice, immunopositive fibers showed a marked decrease in density throughout the sphincter and dilator area compared with the intact control iris from wild-type mice (Figure 3A and 3B). Nerve degeneration in irises and notably wider pupils in response to light of dt/dt mice. Wholemount preparations of irises were stained by immunofluorescence for pan neuronal marker PGP 9.5 (A and B). 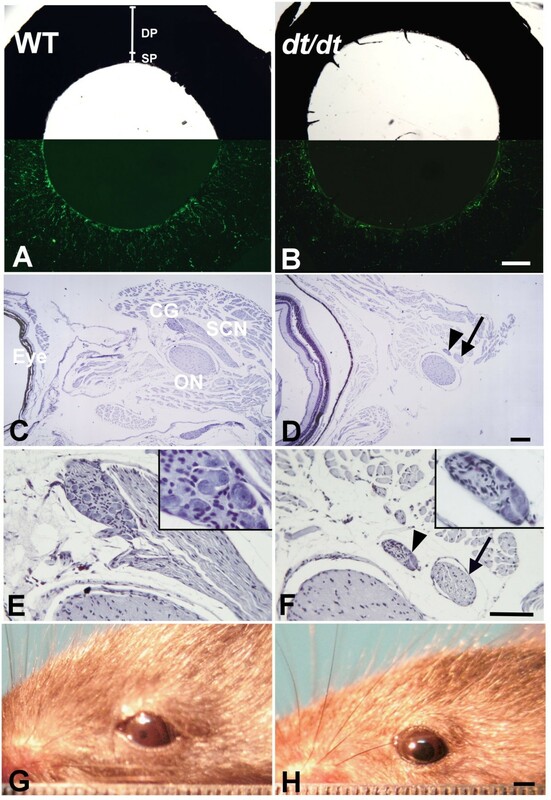 In wild-type mice, PGP 9.5-positive fibers were circumferentially distributed along the pupillary ruff in the sphincter pupillae (SP) area and were radially oriented toward the pupil in the dilator pupillae (DP) area (A). Compared with intact wild-type mice, a few remaining immunopositive fibers exhibited marked decrease in density throughout the sphincter and dilator area in dt/dt mice (B). Ciliary ganglion (CG) and short ciliary nerve (SCN) could be found along the outer surface of the optic nerve (ON) in wild-type mice (C). However, the smaller nerve bundle (arrow) and ganglion (arrowhead) could be observed in dt/dt mice (D). High-power photomicrographs revealed that the ganglion with typical neuronal morphology was observed in wild-type mice (E), whereas the ganglion with fewer number and smaller size of neurons could be found in dt/dt mice (F). To investigate the denervation effect in the iris of dt/dt mice, the light-induced pupillary reflex was tested. The pupillary diameter was narrower in wild-type mice during the pupillary reflex test (G), whereas the pupil was notably wider and iris constriction was weaker in response to light in dt/dt mice (H). Scale bars = 200 μm in A-F; 2 mm in G and H.
Parasympathetic ciliary ganglion and short ciliary nerve running along the outer surface of the optic nerve could be identified in wild-type mice (Figure 3C). In contrast, the smaller ciliary ganglion and ciliary nerve bundle could be found in dt/dt mice (Figure 3D). To illustrate the relationship between the denervation and parasympathetic neuropathy of dt/dt mice, neurons in ciliary ganglia were examined as well. We found that the neuronal number was reduced in ciliary ganglia of dt/dt mice (Table 1, Figure 3E and 3F). These observations suggest that the parasympathetic innervation of irises is poorer in dt/dt mice compared with those in wild-type mice. To investigate the functional defect of autonomic denervation in irises of dt/dt mice, the light-induced pupillary reflex was examined. From the pupillary reflex function test, the pupillary diameter size was notably wider and the iris constriction was weaker in terms of the response to light in dt/dt mice compared with that in wild-type mice (Figure 3G and 3H). The neuronal numbers of ganglia were calculated from wild-type (n = 5) and dt/dt (n = 4) mice. Neurons with both the nucleus and nucleolus in the focal plane were counted. Results are expressed as mean ± SD and *indicates a value statistically different (t-test, P < 0.01) from the wild-type control. 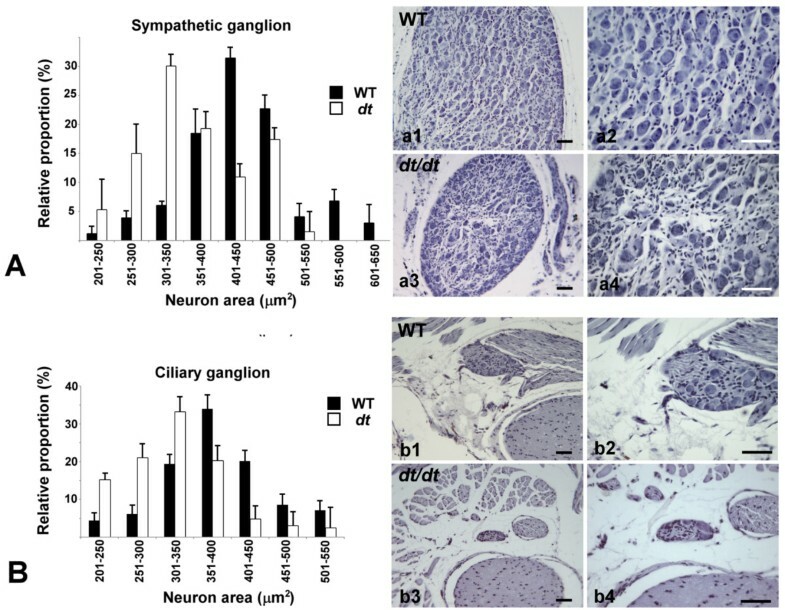 The neuronal number in sympathetic ganglia and parasympathetic ciliary ganglia of dt/dt is significantly reduced compared with those of wild-type mice. To examine the difference in neuronal size of autonomic ganglia between dt/dt and wild-type mice, we quantified the cross-sectional areas of neurons in sympathetic ganglia and in ciliary ganglia of dt/dt and wild-type mice. Histograms of relative proportions documented a large peak between 401 and 450 μm2 in wild-type mice, whereas between 301 and 350 μm2 in dt/dt mice (Figure 4A and 4a1-a4). The greatest proportion of neuron area in ciliary ganglia ranged between 351 and 400 μm2 in wild-type mice, whereas the greatest proportion ranged between 301 and 350 μm2 in dt/dt mice (Figure 4B and 4b1-b4). Besides neuronal loss of both sympathetic and ciliary ganglia, our data also revealed a decrease in neuron size in sympathetic and ciliary ganglia of dt/dt mice. Histograms of relative proportions of neuron area in wild-type and dt/dt mice. Neuron areas in sympathetic ganglia and in ciliary ganglia of wild-type (n = 5) and dt/dt (n = 4) mice were determined (A and B). Neuron areas were sorted into groups at 50 μm2 intervals and the percentage distributions of neuron sizes were divided into classes of the same size range. The greatest proportion of sympathetic neuron ranged between 401 and 450 μm2 in wild-type mice, whereas the greatest proportion ranged between 301 and 350 μm2 in dt/dt mice (A). Photomicrographs revealed that the reduced size of sympathetic ganglion and neuron in dt/dt mice compared with those in wild-type mice (a1-a4). Moreover, the greatest proportion of neuron ranged between 351 and 400 μm2 in ciliary ganglia of wild-type mice, whereas the greatest proportion ranged between 301 and 350 μm2 in dt/dt mice (B). Photomicrographs reappeared that the smaller size of ciliary ganglia and neurons in dt/dt mice compared with those in wild-type mice (b1-b4). Scale bars = 100 μm. In cultured sympathetic neurons from dt/dt embryos at 5 DIV, massive accumulation of neuronal IFs could be observed in cell processes (Figure 5A and 5B). The density of IFs was very high and the pattern of IFs was randomly oriented. Some entrapped organelles together with IF aggregates were found in the cellular process of cultured sympathetic neurons from dt/dt mutants (Figure 5A). Ultrastructural patterns of neuronal IFs aggregates in degenerating cultured sympathetic neurons from dt/dt embryos. 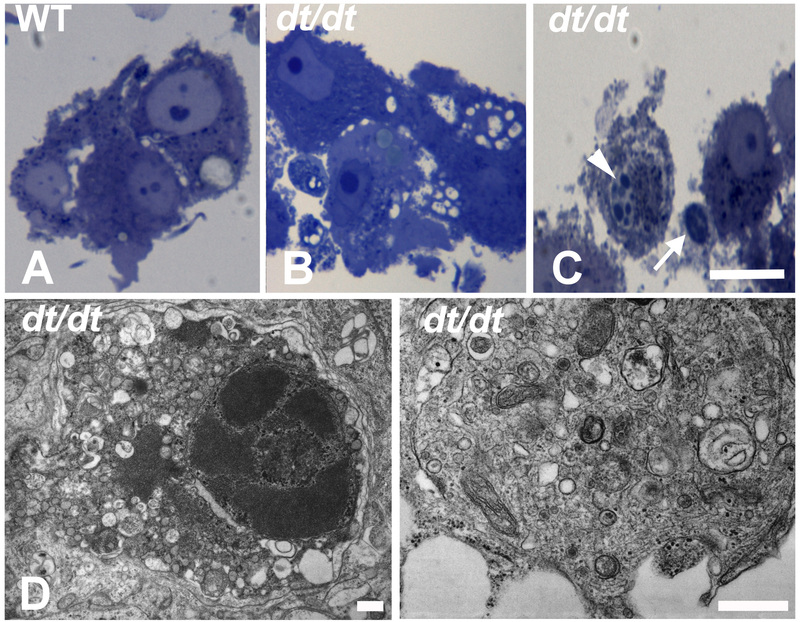 At the ultrastructural level, IF aggregates and randomly oriented IFs were observed in cultured sympathetic neurons from embryonic dt/dt mice (A). Neuronal IFs formed aggregates in soma, suggesting its involvement in the degeneration of neurons from dt/dt mice. Random orientation of IFs and axonal organelles was observed in the swelling processes of sympathetic neurons from dt/dt embryos (B). The swelling process was surrounded by a Schwann cell (arrows, B). Scale bars = 1 μm. Morphological patterns of cultured sympathetic neurons from wild-type mice were normal (Figure 6A). However, prominent vacuolization, typical autophagosomal structures and condensed chromatin could be found in cultured neurons of dt/dt mice under light and electron microscopy (Figure 6B-E). Multi-membraned structures, including late lysosomes and autophagosomes, could be found in the cultured neurons, suggesting that cells are attempting to clean up the damaged organelles (Figure 6E). 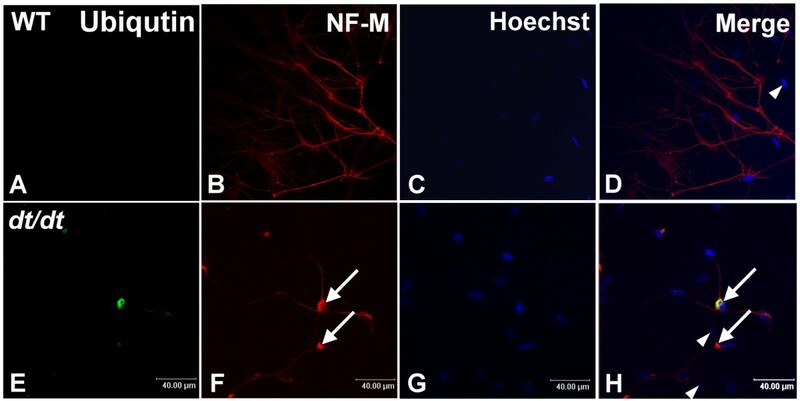 Some cultured neurons with numerous vacuolizations in cytoplasma of dt/dt exhibited apoptosis-like death (Figure 6D). The chromatin condensation with intact cell membrane could be observed in degenerative neurons from dt/dt (Figure 6C and 6D). Vacuolization and chromatin condensation of cultured sympathetic neurons from dt/dt mice. In semithin sections, the morphological patterns of cultured neurons were normal from wild-type mice (A). However, certain membrane-bounded vesicles in the perikaryon (B) and chromatin condensation (arrowhead, C) could be found in cultured neurons of dt/dt mutants. Aside from sympathetic neurons, a Schwann cell could be also found in this primary culture (arrow, C). At the ultrastructural level, images of cultured neurons reveal autophagic structures and prominent vacuolization from dt/dt mice (D and E). Furthermore, the apoptosis-like characteristic of chromatin condensation with intact nuclear envelope and cell membrane could be observed from dt/dt embryos (D). Multi-membraned autophagosomes could be found in the cytoplasm of dt/dt mutants (E). Scale bars = 20 μm in A-C; 1 μm in D and E.
To determine the relationship between IFs and degrading proteins, NF-M and ubiquitin were examined by immunocytochemistry. At 5 DIV, cultured sympathetic neurons from wild-type mice highly expressed NF-M, but not ubiquitin (Figure 7A-D). Neuronal intermediate filament protein NF-M was normally distributed in axonal processes. However, the two proteins of ubiquitin and NF-M could be colocalized in the perikaryon of cultured sympathetic neurons from dt/dt mice (Figure 7E-H). Based on confocal microscopy, the distribution of ubiquitin protein was associated with the abnormal accumulation of neuronal IFs aggregates in degenerative sympathetic neurons from dt/dt mutants. Immunoreactivity of ubiquitin and NF-M in cultured neurons from wild-type and dt/dt mice. Cultured neurons were double-labeled with antibodies against ubiquitin (green) and neuronal intermediate filament protein NF-M (red), and their nuclei were stained with Hoechst 33342 (blue). The ubiquitin-positive reaction was hardly noticeable in neurons of wild-type mice (A-D). Cultured neurons with abnormal accumulations of NF-M were mostly observed in the proximal region of axons and within cell bodies of cultured sympathetic neurons from dt/dt mutants (F, arrows). Some neurons with NF-M accumulations could also be labeled with the antibody against the ubiquitin (E-H). Some smaller nuclei of non-neuronal cells were also observed in the primary culture (arrowheads, D and H). Scale bars = 40 μm. Previous studies revealed the expression of BPAG1n in a variety of sensory and motor neurons from the embryonic to the postnatal stage in normal development. However, morphometric study has shown sensory innervations is significantly reduced in dt/dt mutants [3, 5, 7, 8]. This study indicates that the sensory nerve is not only markedly denervated in the cutaneous part of footpads, but that sympathetic innervation is also severely impaired in sweat glands of young adult dt/dt mice. The sympathetically innervated sweat glands substantially degenerated in footpads of dt/dt mice. This degeneration pattern was demonstrated with immunohistochemistry using general neuronal marker PGP 9.5. Our new finding of the sympathetic denervation adds another criterion for phenotyping dt/dt mice. Ciliary ganglion, like sympathetic ganglion, is a neural crest-derived parasympathetic ganglion [25, 26]. From our observation, the neuronal number of ciliary ganglion was significantly decreased in dt/dt mice. Moreover, the functional assay provides compelling evidence regarding denervation of irises and the wider iridial diameter of pupillary response to light in dt/dt mice. Based on these findings, we hypothesize that BPAG1 gene has an important role in the normal development of the ciliary ganglion. The loss of BPAG1n, a cytoskeleton linker protein, in neurons of sympathetic and parasympathetic ganglia suggests that the cytoskeletal dysfunction may trigger the neuronal death during cell migration. This phenomenon may account for the expression of BPAG1n in numerous neurons during normal development, but neuronal degeneration is limited to peripheral neurons derived from neural crest cells in BPAG1-deficient mice. The autonomic system is considered unaffected by neurodegenerative disorders such as X-linked recessive spinobulbar muscular atrophy and Guillain-Barre syndrome, but observations have revealed autonomic skin denervation [27, 28]. This investigation also demonstrated the sympathetic denervation of sweat glands in footpads and parasympathetic denervation of irises in eyes of dt/dt mutants. The terminal endings of the sympathetic nerve commonly degenerate more quickly than the proximal portions of the degenerating sympathetic ganglia neurons . Skin denervation studies have established an early sign of neuropathy before ganglionopathy is detected . From our studies, cutaneous tissues and iridial wholemounts with immunohistochemical analysis constitute a reliable approach for distinguishing between neuropathy and neuronopathy. Our data provides an evidence of epidermal and iridial denervation in footpads and eyes with autonomic neuropathy in neuronal cytoskeletal dysfunction. Clinical and basic neuropathy has indicated that neurodegenerative disorders are morphologically represented by progressive neuronal damage and are associated with the typical cytoskeleton dysfunction [15, 16, 20, 21]. Other results have also indicated that abnormal aggregations of IF proteins are significantly involved in the mechanism of neuronal death [22, 31, 32]. In the previous study of dt/dt mice, the abnormal accumulation of IFs in degenerating primary sensory neurons was observed in vivo and in vitro. The abnormal accumulation of neuronal IF proteins may impair axonal transport and later trigger neuronal apoptosis cascade of neurons in dorsal root ganglia of dt/dt. In our current study, abnormal translocation of neuronal IFs was also found in the nerve process and soma of cultured sympathetic neurons from dt/dt embryos. It suggests that the deficiency in BPAG1, the cytoskeletal linker protein, may induce neuronal death in the sympathetic nervous system of dt/dt mice during development. Intracellular protein degradation is mainly mediated by the ubiquitin-proteasome and autophagy-lysosome systems in eukaryotic cells [33, 34]. Ubiquitin-proteasome system is chiefly responsible for degrading short-lived proteins and a selective form of catabolism . Repetition of the cycle generates polyubiquitin chains on target proteins, which are then degraded into smaller peptides. In contrast, autophagy is a broad term for the degradation of long-lived proteins and a nonselective form of catabolism . Some studies have revealed that abnormal protein aggregations, which are potential toxins, could be quickly degraded by the ubiquitin-proteasome and autophagy-lysosome systems [35, 36]. Our immunomicroscopy images show the involvement of ubiquitin in degenerating neurons from dt/dt. In addition, preliminary transmission electron micrographs reveal lysosomal or autophagosomal structures and pronounced vacuolization in the cultured sympathetic neurons. Based on our observation, both ubiquitin-proteasome and autophagy-lysosome systemsmayhave essential roles in degrading neuronal IFs aggregations in sympathetic neurons of dt/dt mutants. We have demonstrated the epidermal and iridial denervation associated with autonomic neuropathy of dt/dt mutants. Additionally, abnormally aggregated neuronal IFs may participate in neuronal death of cultured autonomic neurons from dt/dt mutants. Our results suggest that a deficiency in the cytoskeletal linker BPAG1 is responsible for dominant sensory nerve degeneration and severe autonomic degeneration in dt/dt mice. The authors would like to thank the National Science Council of the Republic of China, Taiwan, for financially supporting this research under Grant no. NSC 97-2320-B-040-009-MY2 to K.W. Tseng and NSC 97-2628-B-002-043-MY3 to C.L. Chien. Facilities provided by grants from the Ministry of Education, Taiwan to the NTU Center of Genomic Medicine are also acknowledged. KWT and CLC designed, carried out the main experiment and drafted the manuscript. MLP helped design the experiment and improve the manuscript. YJW and KJL participated in immunohistochemistry assay and statistical analysis. All authors read and approved the final manuscript.